Forbes says Toyota has more to worry about than just its latest mega-recall. Financial analysts are starting to get pessimistic about the company's outlook. Hours after word that Toyota was recalling 7.4 million cars yesterday, S&P Capital cut its rating on Toyota's American Depository Receipts (shares traded in New York) from buy to hold. "Although we have not yet quantified the financial impact, we lower our opinion to reflect headline risk we see from increased headwinds in certain parts of its operations," wrote S&P equity analyst Efraim Levy, according to Forbes. The recall, he said, "takes some of the sheen off its recovering brand image and should have a financial impact, in our view." That seems to be how things have gone for Toyota the past couple of years. First, it overreached in trying to become the world's biggest carmaker, and found itself awash in more than 10 million recalls worldwide. Then, it was buffeted by the recession. Then, the earthquake and tsunami in Japan, followed by floods in Thailand. And just when everything seemed to have calmed down, tensions flared in China and these new recalls came about. That's a cautionary note for Volkswagen as it continues down its beigekrieg path: sometimes, staying a bit smaller is easier to manage. Car and Driver says Sergio Marchionne has finally decided that Alfa Romeo will be back in the U.S. in 2014. (We'll believe it when we see it, which is basically what Car and Driver says, too.) Assuming something doesn't go wrong at Fiat, or that VW isn't able to wrest Alfa from the Italians, here's what the lineup will look like: first, the Alfa Giulia sedan, which comes two years from now and is meant the take on the Audi A4. Then, there will be a crossover that's meant to compete with the VW Tiguan. The magazine says Marchionne wants to sell the 4C coupe in the U.S., possibly in 2014 as well. The Duetto sports car also is bound for America, as well. 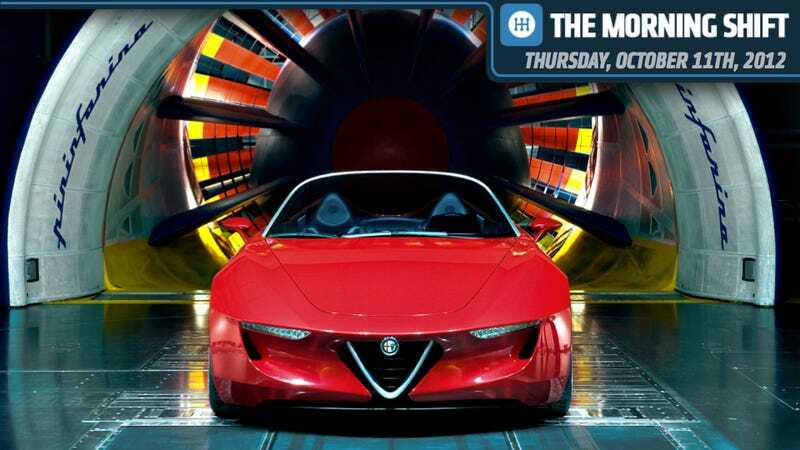 The Duetto, which also might be called the Spider, is likely to be built in Japan in partnership with Mazda. (Yes, you read that right.) The return of Alfa is long overdue: we remember Fiat talking about bringing Alfa back to the U.S. by now. But, it is on Fiat's radar, and its plan is nothing but ambitious. The Associated Press says the annual study of the most popular car colors is out, and for the second year in a row, car buyers' first choice is white. Silver is close behind, followed by black, gray and red. There's a school of thought that says buyers like white cars because their iPhones and MacBooks are white. But I've always heard that white cars are most popular because they're the ones ordered most often by rental car companies. Also, one in four pickup trucks sold are white, because the color works best for commercial use. Presumably, the owners of these white cars don't live near flocks of seagulls. Wired reports on a new rental car start up company called Silvercar that will feature just the Audi A4. Not only that, the Audi A4 you rent will be silver (because it's Silvercar. Get it?) To be sure, the A4 that you rent will be delivered with lots of your pre-loaded preferences, like the radio tuned to the stations you want, and addresses for the places where you'll be staying and holding meetings, There are no counters and no attendants, but you can call a concierge if you need one. The cars will rent something like Zipcars, where you dial your identifier into an app to unlock the car. The return process is even fancier: Silvercar can send you info about traffic, how much time you'll need at the airport, and send you your receipt even before you're on the airplane. Silvercar has raised $11.5 million for the venture, and expects to have cars in Texas before the end of the year. On this day in 1976, Bruce Springsteen's Born to Run became his first-ever Top 40 hit. It came from the same album that included Thunder Road. Two weeks later, Springsteen landed simultaneously on the covers of Time and Newsweek, and launched a career that has him still performing four-hour concerts when other men his age are dining on early bird specials. Today, we'd like to know: are you looking forward to Alfa returning to the American market? Did you ever own or drive one? Or are you running out of patience? Remember there's no right answer or wrong answer. It's Neutral.